First it was the perfect pick-me-up for a burger or turkey sandwich. Then it livened up my BLTA’s. Now it’s put zing in a totally new creation for me…the salmon quesadilla. A fabulous bonus was that this recipe is perfect for saving the poor, sad salmon filets that you had to freeze. It’s almost a crime to freeze salmon, but it does happen. Even planners like me who come armed with a detailed menu and grocery list to the store have tragedy strike. This time it was the dreaded make-up game incident: “What? We have three baseball games tonight? !” Sigh. Guess the grill is NOT getting fired up tonight. Into the freezer goes the salmon. In a large skillet heat 1 Tbsp olive oil over medium heat. Add pepper and onions. Cook and stir occasionally for 5 minutes until soft. Remove peppers and onions from pan and set aside. Add 1 Tbsp olive oil to the skillet. After a few seconds add salmon pieces to the skillet. Sprinkle salmon generously with Lemon & Pepper seasoning and saute. Stir and toss pieces occasionally, until light pink, flaky and cooked thoroughly. Mine took about 10 minutes. Remove salmon from skillet and set aside. Heat either a large fry pan or large nonstick griddle up to medium (I used the griddle set to 300ºF…I was able to cook up two at a time with the griddle). 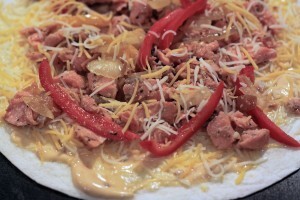 On a tortilla, spread a thin layer of chipotle mayonnaise, then add a sprinkle of cheese, cover with salmon, add peppers and onions and sprinkle more cheese. Lay tortilla flat on griddle and heat until cheese begins to melt. Fold in half to a half-moon shape and allow to cook for another minute. Serve immediately or keep warm on a baking sheet in the oven at 250ºF until all are cooked and ready to serve.